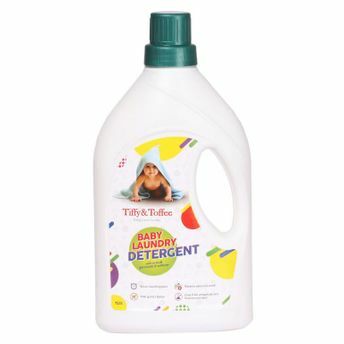 Tiffy & Toffee Baby Laundry Detergent has in-built germicidal properties that kills germs as it cleans, thereby obviating the need to dip the baby clothes and linen in water containing antiseptic lotion after wash. As the soiled clothes are soaked in the detergent for some time before washing, the soils are loosened and the germs are effectively killed. Further, this product has a pleasant aroma unlike the unpleasant smell of the antiseptic lotion. Its fabric softening properties remove the need for post-wash treatment with a fabric softener. The detergent is also low foaming and is easy to rinse in getting rid of the soap remnants.